When most think of Long Island red wine most think of Merlot. When you ask folks who know about some of the best Long Island vintages they will point to 2007 as being one of the best yet – from the early looks of 2010, it may surpass all. From Long Island’s largest producer, Pindar Vineyards, comes this fine, easy drinking Merlot. Pindar Vineyards 2007 Merlot ($15). Plum, Blackberry and Raspberry dominate the nose with hints of earth, smoke and cedar. The fruit does come across as being concentrated along with a hint of dried herbs and spice. The tannins are light and has a good amount of acidity. The ripe berry flavors come across as concentrated on the palate with a hint of vanilla spice. The finish is moderate with a hint of dark cherry and a dusting of coca powder. This wine is a crowd pleaser, light and fruity, but not jammy or sweet perfect for every day. It was great alone or would have been nice with some grilled veggies over a light tomato sauce. At $15.00, this is a great value and is an affordable way to introduce and show friends and family how great the 2007 vintage was. 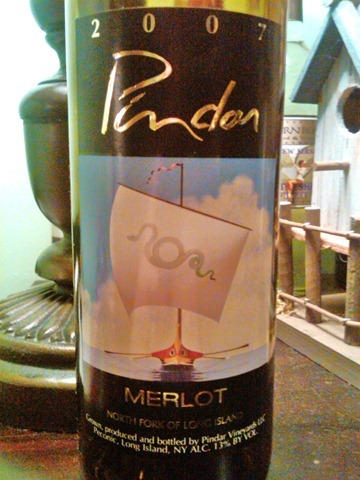 This entry was posted in 2007, Long Island, Merlot, Pindar. Bookmark the permalink.